I’ve always wanted to keep a diary. 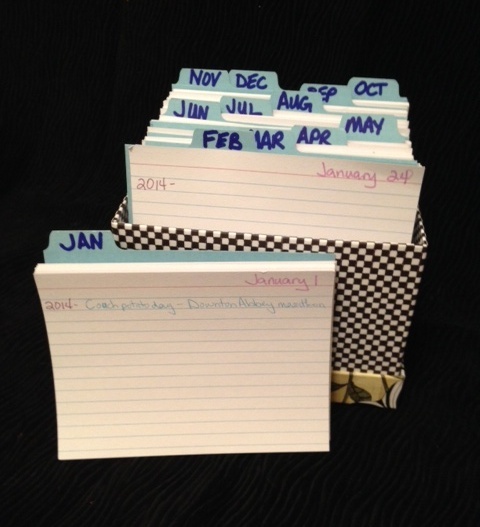 When January 1st rolled around on the calendar, I would make a resolution to document my days. I always had the best of intentions, but after only a few weeks it faded into the background of my busy days. One of the gifts I received when my first child was born was a “Baby’s First Year” calendar. It had little stickers to place on the days he reached milestones, as well as ones to note doctor appointments, etc. I really enjoyed having a separate place to record all his “firsts”. When my daughter was born a few years later, I purchased another one to save all her important dates too. I found myself referring back to my son’s calendar, remembering going through all the same developmental stages with him. Then I decided to use my regular wall calendar in the same way … without the cute stickers. I put everything on that calendar, combining the whole family’s schedules. As the kids grew older, my calendar pages really filled up with all their activities and school schedules. I have saved all these calendars. Over the years, usually during the week between Christmas and New Years, I have gotten into the habit of paging through these old calendars. I usually go through and write birthdays on my new calendar at this time. Sometimes I’m looking for a specific event, other times I’m looking through them to be reminded of old memories and reminisce. This entry was posted in Event Planning, My Thoughts & Opinions, Organization and tagged calendar, card, dates, document, events, January, journal, Memories, Pinterest, resolutions, Schedule on January 24, 2014 by Tracy.